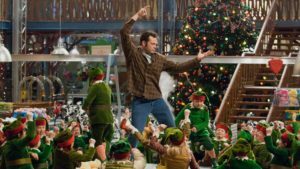 It’s not very smart and it’s not very funny, but there’s still something kind of likable about seeing Vince Vaughn hang out at Santa’s workshop in the North Pole and ride in Santa’s sleigh. 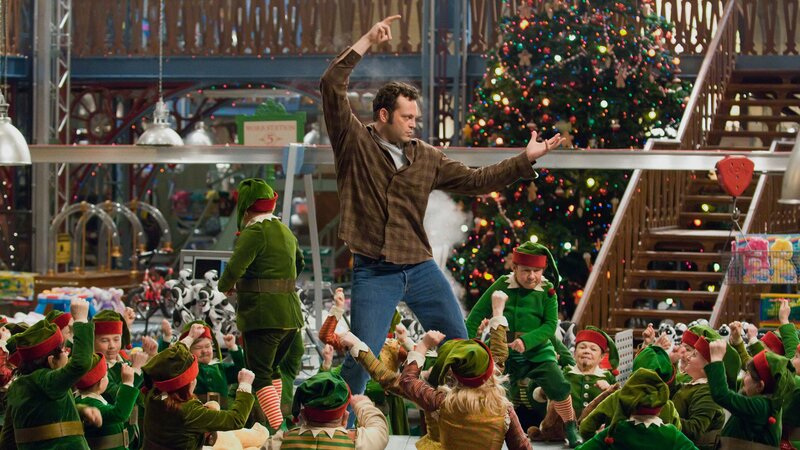 Here’s a Vince Vaughn movie made for kids that finds itself stumbling with most of its beats. First of all, there’s the humor. Vince Vaughn is an R rated kind of comedian. He’s at his best when he doesn’t have to hold back, as seen in movies like Old School, Wedding Crashers, and of course, Swingers. His motor-mouthed convincing talk persona doesn’t really fly in a movie made for kids where he’s hanging out with little kids one day and giving them speeches another. And that’s just in the first act. When Vaughn’s character, Fred, gets to the North Pole, things do stated to pick up, but that’s only because everything that came before it was so terrible. The story of Fred and his brother, Santa, is somewhat interesting, and involves spending time in Santa’s workshop as well as dealing with a pretty menacing villain. The humor in this movie definitely does not work, and the story is hit and miss, but it’s still a light-hearted, family friendly movie about helping out Santa in the North Pole. That alone goes a long way. 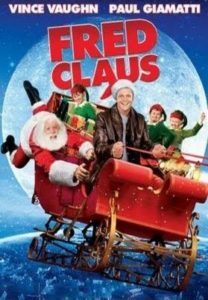 Fred Claus is a silly, but fun Christmas movie for kids. It’s not the kind of thing that would hold up with any sort of serious audience, (for one thing, the humor is not very good,) but the story is actually somewhat interesting. And it gets better as it goes on. For a lighthearted Christmas movie, the checklist is simple. We want to see Santa, we want to see The Noth Pole, we want to see the elves, we want to see Santa flying around in his sleigh, and if the movie can offer any new insights or ideas about how all of this happens or came to be, then it is all the better for it. Fred Claus may not be a great movie, but it does all of these things with a certain degree of success. Thr movie starts out by giving us some backstory in the form of a flashback to show how Santa cane to be. We see older brother, Frederick, living in a small house in the middle of the woods, back in olden times, with his parents. A baby named Nicholas is born. Nicholas grows to be overly kind and generous, even to a fault. When Fred gives his brother presents, for example, Nicholas gives the presents away to orphans. A number of ideas get established in this opening sequence, such as why Nicholas is called Saint Nick, his first time sliding down s chimney, and his notion that every kid deserves a present. We also start to understand a little bit about Fred’s resentment for his older brother. Now we move into present day. Here’s where the movie gets pretty dopey and stays that way up until Fred makes it to the North Pole. In Chicago, Fred has a relationship with a woman named Wanda (Rachel Weisz,) who is a meter maid. Fred is a repossession agent (a repo man.) We watch Fred supervising moving men who are taking things out of a mans house, when the man can’t afford to pay for them. Fred gives the mans kid daughter a speech about her future, and how she’s going to get pregnant at a young age. This stuff isn’t the least bit funny. It gets worse. Fred goes to see Wanda and she repeatedly asks him what tomorrow is. It’s her birthday, only he has no idea. At a certain point you can just guess. His answer is that tomorrow is tomorrow, and he tries to make that into an elaborate explanation. This is followed by him posing as a Salvation Army Santa to raise some money and getting chased down the street by an army of angry Santas. The stupidity goes on for a while. It includes a boy named Slam who comes and hangs out at Fred’s apartment, climbing through the window as if they are buddies. Why would Fred by friends with this kid? Forget the inapptopriateness of the relationship where a man is friends with a boy and hangs out alone with him in the mans apartment, but what does Fred have to gain from this friendship? Especially when you consider that he’s being portrayed as an incredibly selfish guy in most other scenes. Luckily the movie does get a little better once Fred arrives, but it still takes some time. First Fred gets attacked by an elf secret service team. Then Santa shows him around and puts Fred to work, stamping naughty or nice on a paper for each kid. There’s a magic snow globe where if you say a kid’s name, you can watch one moment in their life that shows whether they are naughty or nice. This turns out to be very convenient for the plot, which lets Fred look in on Slam, as well as his girlfriend, Wanda, to see what they’re up to while he is here, at the North Pole. The scenes in Santa’s shop are kind of fun, including Fred getting up on a table and dancing with the elves, and his giving the DJ elf a hard time about always playing the same song. Most of the plot points are kind of corny, including a subplot about one elf, Willie, (played by John Michael Higgins,) who has a crush on Santa’s Little Helper, (Elizabeth Banks.) Fred gives Willie advice on how to get the girl, and this includes giving the elf dance lessons at a bar, after they think everyone has gone home. None of this is very intelligent, but it’s some light hearted, goofy fun, kind of the in the same way that something like The Santa Claus is. Willie becomes Fred’s confidant while up there, in the North Pole, and Fred bunks with him to become not only a friend, but also a house guest. There’s even an antagonist or villain on screen here, in the form of Clyde, (Kevin Spacey,) an IRS agent who plans to shut Santa down. He gives Santa three strikes, and of course during the movie, Santa ends up getting all three of them. Clyde seems mischievous and like he’s up to something, and as the movie goes on, we find out why. Meanwhile, Fred has some unresolved issues to work out with his brother. At one point they get into a fist fight and Santa throws his back out. That means there’s only one man who can take over and save Christmas.